The stylish Vintage series has been cleverly designed to have a broad appeal by being distinctly Retro rather than conventionally traditional - a well-balanced modern-cooker with a friendly and familiar look which will fit wonderfully well in a traditional farm style kitchen, look stunningly right in a plainer or Shaker-style kitchen, or be a great focal point in a contemporary setting. It’s pared-down looks quietly celebrate the cookers of yesteryear whilst keeping its feet firmly planted in the 21st century. The subtly bevelled panels and window arch on the doors, together with the removable rear upstand, lend character and presence which is complemented by the very nicely detailed and well made control knobs, handles and towel rail. These in turn are set off by the stainless steel hotplate with its appealingly rounded-off front edge, single-piece construction and recessed cast iron pan supports. It all looks and feels very good indeed. Open the (side-opening) main oven door and withdraw the full-width oven/grill tray and you may be surprised by the depth of the oven, which speaks to the impressive 59 litre capacity. This programmable oven is multifunction, with a variety of fanned and conventional settings to give you all the versatility you could need. Above, a nicely constructed electric grill with glide-out full width grill tray, and on the right is a good sized fanned oven with 73 litres of space perfect for batch baking, everyday cooking or warming. All cavities have an easy-clean enamel lining, and the inner door glass is removable for easy cleaning on the main oven. The five burner hob includes a triple-ring wok burner with a very convincing 4kW of cooking power, plus a 3kW high burner, two 1.75 and a 1kW simmer burner. Available in black or cream gloss finishes. It all adds up to a very alluring package very comparable in look and specification to the Smeg Victoria TR93 but - and this is very sobering - at virtually half the price. With the same cavernous 59 litre main oven as the three cavity model, this multifunction oven is highly versatile, with fanned, non-fanned and grilling functions galore should occasion demand. 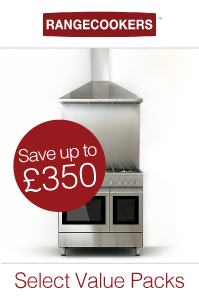 Alongside is a very handy 40 litre second oven with no fan, a variable grill and a rotisserie function. Both oven doors are drop-down and feature removable inner door glass for efficient cleaning, and both ovens have easy-clean enamel. Underneath is a useful storage compartment with a flap door. The same attractive five burner gas hob gives you a triple-ring wok burner with a very convincing 4kW of cooking power, plus a 3kW high burner, two 1.75 and a 1kW simmer burner. Available in black or white gloss finishes or stainless steel. The “Pro” tag derives from the fact that this model borrows its hotplate and rear upstand from DeLonghi’s Pro series, with a flat front edge and stainless steel upstand. Other than that, the look and feel is all Vintage, with the added benefit of some characterful steel legs rather than tubular. A simple proposition, the huge yet efficient 80 litre oven is A-rated and multifunction, so you can use various fanned or conventional methods to cook, grill, defrost or simply keep food warm. The drop-down door has removable inner glass, and there is a practical storage compartment below. On top, five gas burners include a 3.5kW wok burner and automatic ignition. Available in black or light blue gloss finishes, or stainless steel. This very attractive collection of compact range cookers represents amazingly good value. Far from feeling like a cheap alternative - far from it - any of these cookers would be one to be very proud of. Competition for this format and this price-point is very strong, but DeLonghi are a very trusted brand in the UK and they have put a lot of work into making sure the Vintage collection ticks all the boxes. 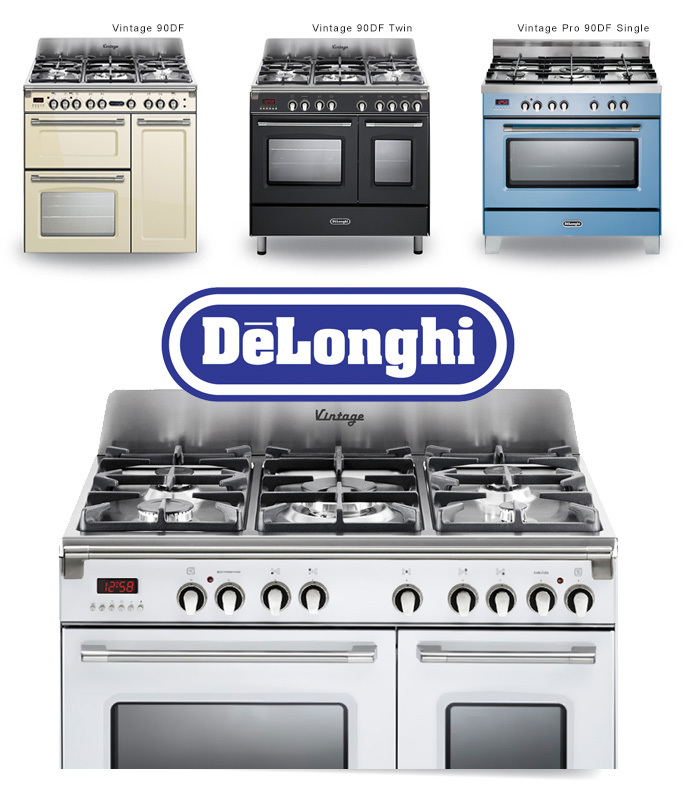 We think they have done a great job of offering consumers a choice of highly competent and appealing range cookers, and they even include a two year warranty.